Chickasaw Boomer Blast Fireworks Show Rescheduled for Saturday, July 8, 2017. 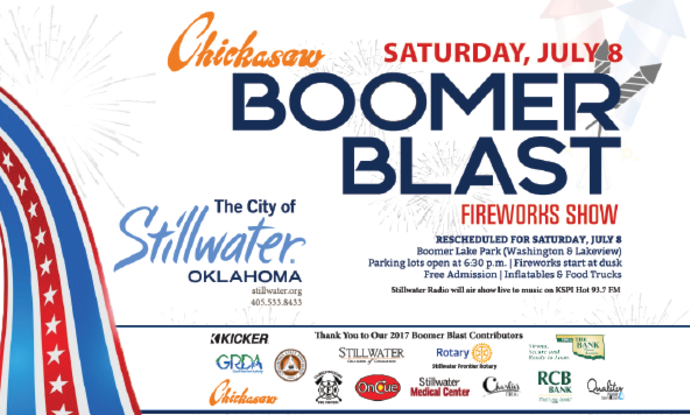 (STILLWATER, Oklahoma / July 5, 2017) – The Chickasaw Boomer Blast Fireworks Show is rescheduled for this Saturday, July 8 at Boomer Lake Park (Lakeview Road and Washington Street). There will be no fireworks show on Wednesday, July 5, due to remaining wet conditions at the park. Heavy rains on the evening of July 3 made the park’s grass parking lots too soft to park vehicles. Free parking lots at the park will open at 6:30 p.m. on Saturday and the firework show will begin at 9:35 p.m. Residents are encouraged to bring lawn chairs and blankets to enjoy the show. Lakeview Road Bridge will close to traffic to allow pedestrians to watch the fireworks. Saturday&apos;s program and activities will remain the same as those originally scheduled for July 4. The Stillwater City Council will also host a meet and greet table on the southwest side of the lake. Residents can also listen to a live remote from Chickasaw Boomer Blast on Stillwater Radio KSPI Hot 93.7 FM. The City of Stillwater would like to thank Chickasaw Telecommunications Services, Oklahoma State University, Kicker, Stillwater Medical Center, Grand River Dam Authority, The Bank N.A., Central Electric Cooperative, Stillwater Chamber of Commerce, OnCue, RCB Bank, Stillwater Frontier Rotary, Stillwater Professional Firefighters Local 2095,Arvest Bank, Red Rock Bakery and Charlie’s Discount Drug for their sponsorships.